You are currently browsing the tag archive for the ‘wax’ tag. I’ve decided to try my hand at a little bit of this new trend called “upcycling”….which is like the new black or something like that. Actually, it’s the new & improved version of recycling-slash-refurbishing used and/or previously loved goods. This is my little DIY project of turning an old candle jar into a nifty little storage container. This was my used Jonathan Adler candle jar. After the candle wick burned down to the end, I didn’t quite know what to do with the leftover jar, & I felt like it would be such a waste to throw out such a pretty & perfectly good jar. So, I decided to turn it into a storage cup. First, to clean out the last bits of candle wax: I poured approx. 1 inch of water into a cooking pan & placed my candle jar on the pan. I turned the stove onto a low heat so the candle wax could melt evenly. Next, I heated the pan just enough to let the candle wax melt. Note: DO NOT put the jar in the microwave to melt the wax. Some candles have a metal clip to secure the candle wick, so it’s better to melt the wax over the stove instead. Once the wax was melted, I tossed out the metal clip for the wick & poured the remaining candle wax into another candle jar. (After using up this candle, I bought a replacement candle because it was my favorite.) For all of the last bits of wax I just used a paper towel to wipe the inside clean. I also thoroughly washed the jar with soap & hot water before using it. Finally, the cup is ready to be used for whatever is to be desired. 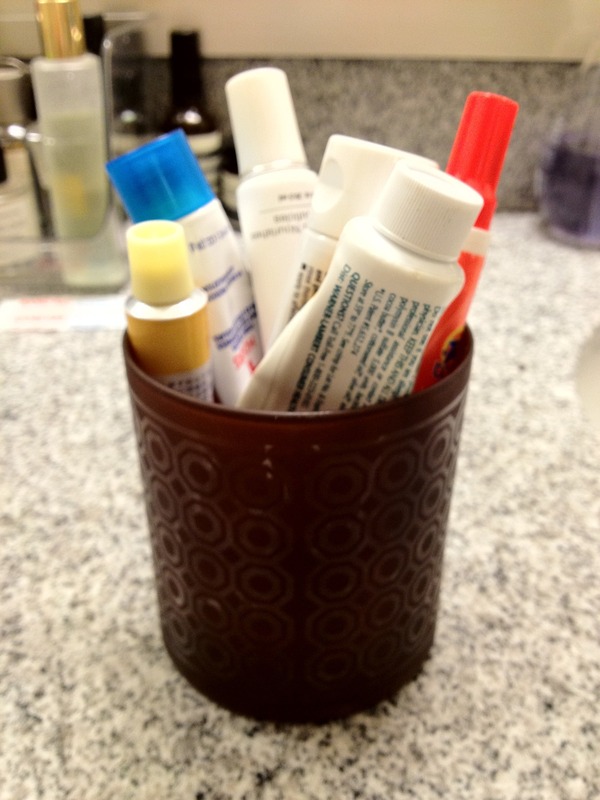 I used my candle jar to hold all of my necessary tubes in my medicine cabinet. It really frees up a lot of space in the medicine cabinet. Plus, it adds a bit of eye candy to a rather sterile medicine cabinet. Also, just in case you’d like to know…this was the Jonathan Adler Acapulco candle. I also have the JA Capri candle, & they both smell utterly divine! !